What are Youth of Character Awards? Home / What are Youth of Character Awards? We encourages our local educators and youth leaders to nominate young people who they feel are worthy of such an honor. All student nominees are sent a letter notifying them of their nomination and are recognized at our Youth of Character Awards Banquet in March. Students are also given an opportunity to submit an essay on how they live their life by at least one of the Five Marks of Character and also how they demonstrate their community involvement or volunteer services as it relates to that particular Mark of Character. A selection committee judges the essays based on compelling content and understanding of character in each of the Five Mark categories: Trustworthiness, Respect, Accountability, Citizenship and Kindness. Additional awards are also given for the essay awards. The Youth of Character Awards Banquet will be held on Tuesday, March 26th at the Best Western Ramkota Exhibit Hall -3200 W. Maple Street, Sioux Falls, SD 57107 at 6pm to recognize all nominees and to announce each of the essay winners. The person nominating a student, as well as the student being nominated will be given a complimentary ticket to attend the banquet. Tickets for family to attend the banquet will be available for purchase. 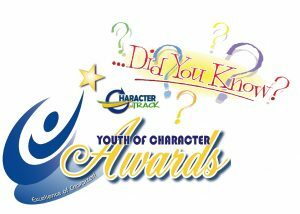 Youth of Character Awards Nominations will be taken starting in January 2019. Please check back with us to nominate a deserving student.